Those looking for a Shower Bath Suite, have made a very wise decision. 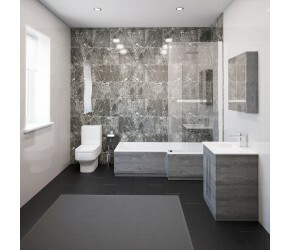 This type of suite is used widely in both large and small bathrooms and provides an excellent option for those wanting to maximise available floor space in their bathroom. The clue is in the name of how this space saving is achieved - Shower Bath Suites combine the shower within the bath unit, there are many different style of shower bath to choose from, in both contemporary and traditional styles. These baths generally come in either a P or an L shape - featuring extra space at the shower end, usually with a shower screen. We have matched the perfect range of bathroom furniture and appliances our Shower Bath Suites - so just get in touch if you have any questions about the range, or would like a bespoke bathroom suite creating around your exact requirements. These complete bathroom suites, which feature straight baths as the bath of choice - provide an excellent option for modern and traditional styles of bathrooms. Straight Baths are available in double ended, single ended and even whirlpool options - allowing your bathroom to benefit from a bath that suits your exact needs. These suites have been put together by not only our suppliers - but also our in house design team. 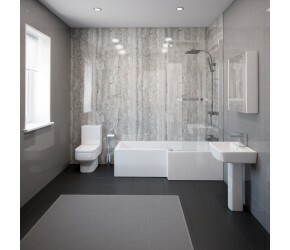 Our design teams can also combine different bathroom products to provide a bathroom suite based around your exact preferences and requirements. If you have any questions about these suites, please do just get in touch and we will be more than happy to answer any questions that you may have. If you do not have the space in your bathroom, or the inclination for a bath - then our range of Shower Enclosure Suites are perfect for your bathroom space. 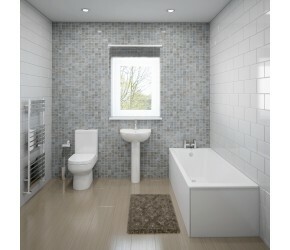 Typically, they include a Shower Enclosure, Toilet and Basin - all in a matching designer style. 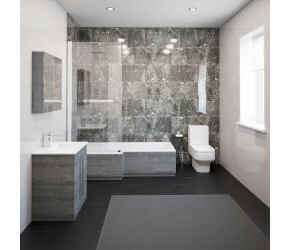 In purchasing these items as part of a bathroom suite, we can apply discounts across the number of products within the suite - helping deliver your goods to you at the best possible price point. Enclosures within this range include Bi-Fold, Quadrant and Pivot enclosures. All of these suites have been handpicked from just a few carefully chosen suppliers - all of which have been chosen on account of their beautifully designed products, of the highest quality. If you have any questions about any of our shower enclosure suites, please do just get in touch and we will be more than happy to help. Bathroom Furniture is a key part of any bathroom, adding to the design, style and feel of a bathroom - as well as providing essential storage. 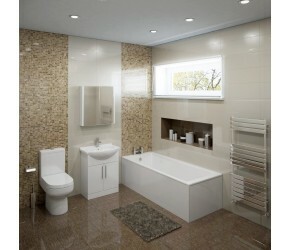 The importance of bathroom storage cannot be overstated - it keeps a bathroom looking smart, clean and tidy. Keeping everything tucked nicely out of sight. 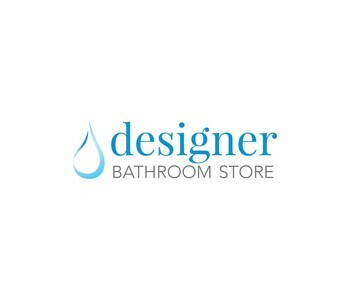 At Designer Bathroom Store, we have created a range of suites which incorporate a fantastic range of bathroom furniture - helping you create and maintain an orderly bathroom. These suites also incorporate baths, showers and WC units. Handpicked from just a few carefully chosen suppliers, we supply these suites with massive confidence in both their style and quality.